Yooralla can support you to participate in any recreational pursuits you enjoy. We specialise in supporting people of all ages and disabilities and believe that anything is achievable. 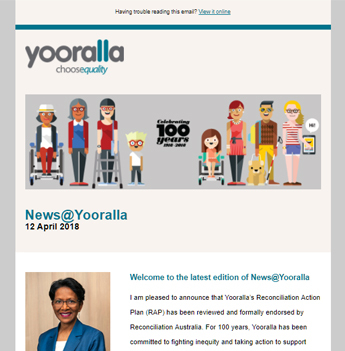 If you enjoy participating in group activities, Yooralla run regular activity sessions, camps, workshops and courses, often with other community groups. You will find some of our most popular recreational activities listed below, however if you would prefer to enjoy an activity on your own, we can assist with that too. We are here to support you with whatever goal you want to achieve. Register your interest in any of Yooralla’s school holiday programs, children’s camps, holidays for adults, youth groups, and social groups for adults by recording the activities that catch your eye. Surfing, water skiing, snow skiing, abseiling, bowling, tennis, fishing, golf, sailing, scuba diving, kayaking or camping. Enjoy visual, musical or performance arts; join a class and access training to assist you to build your range of techniques across various art forms. A trip to the theatre or movies, enjoying a gallery, museum or art show, or visiting markets. Gym sessions, fitness classes, team sports, swimming classes, or training for your fitness goal. A day at the footy, the ballet, catching a live band, a festival, or maybe just a night out with friends. Meditation, yoga, music, a health spa, or a day at the wineries. We can support your holiday plans – from a weekend away to a few months travelling. We can do everything from planning your travel, accommodation and supports, insurances and itinerary, to assisting you on the trip. Whether it’s for parents and children to share a day activity, or for a family to take a trip away together, we can support your family to make it happen. Yooralla’s holiday programs and camps are a great opportunity for children and young people to learn, make friends and have fun in a fully supported environment. Our camps are packed full of activities – anything from boating, abseiling or climbing, to campfire concerts and dress-up nights. Yooralla can assist you with anything recreationally focused. Simply tell us what you’re interested in and we will support you to make it happen. We are the disability specialists; we have almost 100 years of experience supporting people with disability. We provide flexible services, customised to your support needs. Our staff have extensive experience supporting people with high and complex needs. We uphold the highest standards of quality and safeguards. We actively promote and uphold the fundamental rights of people with disability as equal citizens, as advocated in the United Nations Convention on the Rights of Persons with Disabilities (2006).